On July 20 2015, Wizards of the Coast announced a radical slate of changes to Magic Online, especially for non-Pro Tour formats. Vintage players quickly found that prizes of substantial monetary value were replaced with Play Points, and Daily Events would become 3 rounds of Swiss. In the three weeks between the announcement and the change taking effect, Wizards published six Daily Event results. The same rate held in the three-week period after implementation, and in the three weeks preceding the October 20 Magic Online announcements, by which point the Daily Events had been altered to a new 4-round structure. In contrast, the three weeks prior to the Play Points announcement had 16 published results. That period was unusually busy for Vintage online, but it demonstrates that Play Points and 3-round Dailies failed to build on any existing momentum. The Wizards announcement of the Power 9 Challenge was a thrilling about-face. Instead of smaller and less-rewarding tournaments, Wizards would offer real Vintage prizes and coordinate less-frequent but larger and more meaningful tournaments. Even so, the announcement expressed some doubts that the 33-player minimum would be met, and stressed that a 12-player minimum Daily Event would be available at around the same time. Mishra’s Workshop decks had proven to be extremely powerful in the Vintage metagame of Summer and Fall 2015, prompting a restriction of Chalice of the Void, announced on September 28. Dig Through Time was also restricted, due to fears that it was crowding out other blue draw engines. Thirst for Knowledge was unrestricted, despite having formed the backbone of one of the most numerically dominant strategies in Vintage history. Tezzeret the Seeker + Time Vault blue decks, smoothed out by Thirst, achieved incredible levels of tournament success in Spring 2009, prompting a restriction. Since the announcement, there have been two substantial events, Ovino X and MKM #3 (both in Europe). Both primarily featured well-known decks, although a Blue Goblin Charbelcher and a Green-White Hatebears deck notably made the Top 8s. The most interesting and worrisome development was the 1st-place finish of a Tezzeret/Thirst/Thoughtcast deck at Ovino X. An outside observer could be forgiven for thinking that the Power 9 Challenge on October 24 would be a poorly-attended event which simply rehashed the dominant decks of yesteryear and yester-month. That expectation was shattered on all counts. 100 players eagerly attended the inaugural Power 9 Challenge. These players brought an incredible variety of decks, bearing almost no resemblance to other recent results. The full Top 16 decklists can be found here. For example, three Mishra’s Workshops decks made the Top 16, but only Goyobean’s 16th-place Hangarback MUD list is the typical Sphere of Resistance concoction. The two Workshops decks in the Top 8 were an unconventional Dark Depths combo build and “Workshop Affinity.” Why did traditional Workshops perform so poorly? I believe that players were simply running too much mana and too many hate cards. Every Top 8 deck had plentiful artifact destruction or plentiful artifacts, including 8 copies of Serenity in the Top 8. Only one Gush/Delver player reached Top 8, Diophan in 2nd place. Without Delver decks powered by Delve spells, the Workshop decks no longer seem to have the plentiful prey of seasons past. The MTGO Power 9 Challenge may have been the true “breakout tournament” for Jace, Vryn’s Prodigy. The Top 8 featured 1 Jace, the Mind Sculptor, 4 Dack Fayden, 2 Tezzeret the Seeker, and a whopping 9 Jace, Vryn’s Prodigy. Similarly, only 3 Snapcaster Mage could be found in the Top 8, all in Lampalot’s 1st-place BUG list across from 2 of those “Baby” Jaces. In fact, Jace was also the most popular creature in the Top 8, edging out Lodestone Golem from the two Workshop decks and blowing away competition in the blue-based decks. This suggests that Baby Jace is likely taking slots from both creatures and planeswalkers. I suspect the unrestriction of Thirst – incentivizing discard abilities and filtering for combo pieces – combined with the relative abundance of lower-power creatures, has made Jace into a playable card. Jace seemingly fills a different role than Snapcaster or larger planeswalkers, and we may see more balance as the metagame settles. 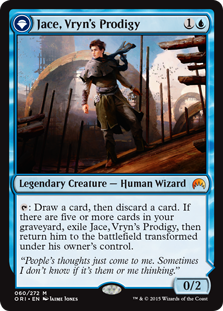 On the other hand, he is the lowest mana-cost Planeswalker with subtype “Jace,” which may just be enough to keep the other Jaces on the sidelines for the time being. Being unaffected by Thorn of Amethyst surely helps as well. Perhaps the most surprising way to view these results is to look at the structure of the blue decks in the Top 16. There were nine copies of Ancestral Recall, and an exactly equal number of Preordain. Despite being unrestricted, and a cornerstone of blue decks in recent times, six of the nine blue decks opted to omit it entirely. Between consistency-obsessed BUG Fish and combo-centric Tezzeret decks, players just didn’t prioritize Preordain or structure their manabases with cantrips in mind. This argues in favor of a lack of susceptible opponents as the cause of relatively few Workshop decks in the high-finishing places. There were 11 copies of Thirst for Knowledge played, spread across three decks. Dain5’s 10th-place list featured 1 Preordain and 3 Thirst for Knowledge, but otherwise the two cards inhabited distinct decks. The top 16 featured 12 copies of Gush, with only 2 overlapping in The Atog Lord’s 4 Thirst for Knowledge deck. Adding to the diversity, exactly one player ran a Thoughtcast engine and another player ran Gifts Ungiven. This suggests that the restriction of Dig Through Time has largely been successful in promoting a diversity of blue draw engines, at least in this sample size. Zero copies of Oath of Druids made the Top 16. Auriok Salvagers combo is basically unplayable on Magic Online, and that combo is a significant portion of the allure of Oath of Druids. With Delver and Workshops largely absent, it seems that Oath was another deck that simply lacked obvious prey. Zero copies of Cavern of Souls featured in the Top 16, suggesting that even with the newfound importance of Jace, Vryn’s Prodigy the limelight may have returned to instants, sorceries, and artifacts. Basic Swamp, and more importantly basic Forest, were totally absent as well. Four copies of basic Mountain were present, always accompanied by at least 3 Ingot Chewer. This suggests that red – and not green – remains the premier anti-artifact color. Flame-Kin Zealot made no appearance, being displaced by Dragonlord Kolaghan in traditional, anti-hate Dredge, and Chancellor of the Annex in transformative Dredge strategies. Finally, it’s worth noting that the Thirst decks all included Blightsteel Colossus, and therefore joined the rest of the Top 16 in omitting Goblin Welder. Magic Online players have shown they are willing to embrace Vintage enthusiastically when the prospect of serious competition and meaningful prizes are combined. The result has been the largest Vintage tournament since the Restricted List announcement, as well as the first issuance of digital Power 9 since Vintage Masters. 100 players in a format as marginalized as Vintage would have been one of the largest tournaments of many past years, but with luck the online Power 9 Challenge series will only continue to grow. By eliminating transportation and card availability as prohibitive factors, the format may finally flourish on a large scale if given the proper support. I put my money where my mouth was for this Vintage tournament. I brought my Pitch Dredge deck, hoping to catch a piece of Power and just maybe a set of Battle for Zendikar. While I didn’t take home 1st or 2nd place, I did reach Top 16, as did Nukular on the same 75 cards. While I tried a number of approaches over the past year, I found myself on 74 of the same 75 cards – only cutting the Mana Crypt for a 4th Urborg, Tomb of Yawgmoth for consistency reasons. Fortunately, I was able to record my matches while playing in the event, and they are available now in the embedded YouTube playlist below. If you’re thinking of picking up the deck, my commentary may help you get a feel for which resources to prioritize and which cards to play around. Thank you for reading. As always please let us know your thoughts in the comments below or in the forums.